A New Take on Country that will Make You Smile as You Dance. 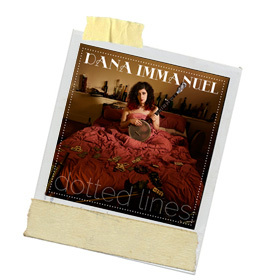 While the thread that weaves throughout this album is most definitely Country in origin; Dana Immanuel goes off at many different tangents throughout to make music that crosses all barriers and is all the better for it. Several years ago I once complained that I was suffering from ‘banjo fatigue’ as every album I heard shoe horned in that much maligned instrument to attract the Country pound. But, in recent years it’s been the pedal-steel that is meant to identify something as ‘Country’ so it was like the welcome return of a long lost friend when I heard the opening notes of Dana Immanuel’s banjo on title track Dotted Lines which broodily kick-starts the album. All throughout the song, Dana’s voice is passionate beyond belief as her backing musicians manage to create a dark and slightly Gothic backdrop behind her. My head spun next as track #2 Mile High is a jaunty stroll through a well constructed Roadhouse song that won’t be out of place on daytime radio now that ‘Country is cool’ again. Later we find a song called Devil’s Money which sounded a bit ‘thin’ when I first heard it; but cranked up loud on the car stereo it took on a life of its own – proving you shouldn’t judge music on the first listen. The banjo comes into it’s own again as it duels with a mighty fine fiddle on a Dolly influenced Wild Things which, like most other songs is more literate and even intelligent than the melody would have you expect. It took a few listens to this album to actually ‘get it’ as the production and melodies err on the Poppier side of Country Music; but at times, such as Going to the Bottle there’s a faint whiff of Dinner Jazz in the style of Marion Montgomery; as Dana tells a very intricate story. Earlier on the splendid Life in Colour the song certainly smacks of being Country but of the John Denver persuasion; which is no bad thing in my book. The album closer Be Like Arnie, is my favourite track here as it’s a lovely story and when the trumpet slides in the hair on the back of my neck stood on end. This won’t be for everyone; as the fashion these days is primarily for edgy miserabilism (and I’m a fan) but every now and again we all night a bit of music that is fun and enjoyable and not embarrassed to be so.